It's important to keep inflation in mind when you consider changes in your salary or wage. The U.S. economy is usually inflationary. Inflation means that prices are increasing everywhere. Unless you get a raise that at least matches inflation, your salary will have a less purchasing power next year and you will be able to afford fewer items. How much of a raise do you need to match inflation? You can compute this with any future inflation calculator online. Question #1: How much of a raise do I need to keep up with inflation? 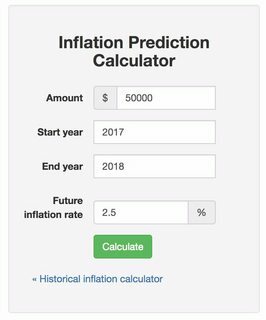 Let's use this calculator to predict inflation. First, enter your salary in the "Amount" field (in this example, we'll say $50,000). Set "Start year" to the current year and "End year" to next year. Finally, we must predict the inflation rate for the next year. Given that inflation over the past decade has averaged about 1.5%, we'll say 2.5% in order to leave some wiggle room (most economists think inflation will increase over the next year). In order to keep up with inflation, a $50,000 salary in 2017 must become $51,250 in 2018 in order to maintain the same purchasing power. In other words, a $51,250 salary in 2018 can only buy you as much as $50,000 could in 2017 (assuming 2.5% inflation). Question #2: How much was my previous salary worth? When someone says they were making X dollars back in the '80s, how much were they really making? It's simple to compute how much historical pay was in today's dollars. To begin, go to any historical inflation calculator. And hit calculate. Turns out they were making nearly $88,000 -- not too shabby. Whenever you see an old dollar amount, you should adjust it for inflation to make any sense of it. Inflation-adjusted dollars reflect "real value", whereas non-adjusted dollars reflect "nominal value". It's important to compare real dollar values. 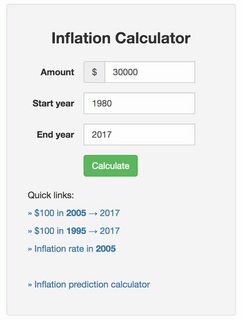 An inflation calculator can do a lot to help you understand how pay, wages, and salary have changed over the years. Try it for yourself!